The performers in “Soil Turning” dance together in the final moments of the performance. 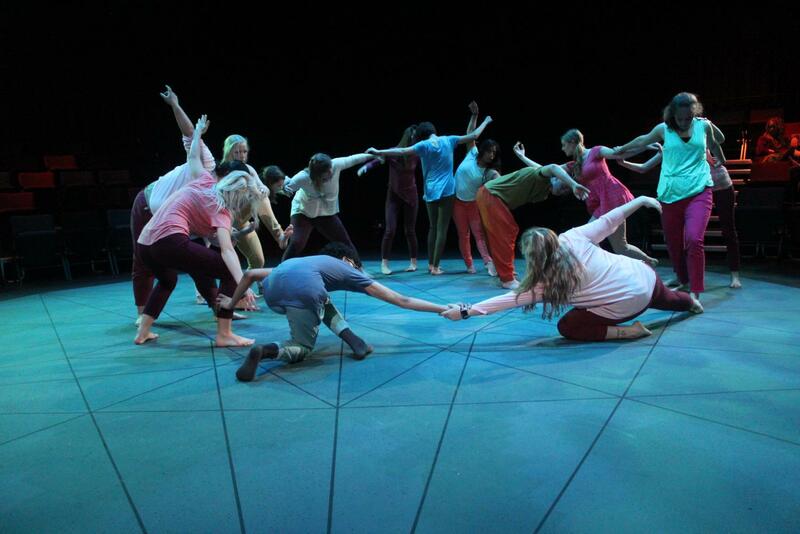 Highlighting personal growth and identity through movement, 14 Luther students opened their performance, “Soil Turning” in the Center for the Arts on Friday, May 4 at 7:30 p.m. The dance showcase, performed in three separate spaces in the Center for the Arts, is the culmination of a semester of collaborative dance. Visiting Assistant Professor of Dance Andrea Vazquez-Aguirre constructed the piece and facilitated group discussion around the theme of identity. The performance takes place in three separate movements, beginning in the CFA hallway, moving to the Barefoot Studio, and concluding in Jewel Theatre, with the audience literally following the dancers to each performance location. The group held auditions at the end of first semester and worked on their performance during class time twice a week. All of the dancers created the choreography for the CFA hallway. Performers dance as a whole unit in both the CFA lobby and Jewel Theatre, but work individually and in small groups to tell their stories of personal identity in the Barefoot Studio. Each performance space brought different potential for expression and the students interacted with their surroundings through their movements. Performer Inga Aleckson (‘18) enjoys the organic expression that flourishes from this performance. Vazquez-Aguirre used this philosophy to facilitate group movement in the show and hopes that this idea can inspire the audience to consider their own personal identities. Performer Haley Steffen (‘19) uses her solo dance to highlight a personal experience in her life that has shaped her identity and she hopes that this openness will come across to the audience. The dancers also collaborated with Associate Professor of Music and Composer-In-Residence Brooke Joyce’s composition course, who provided the music for the performance. Steffen is hoping that “Soil Turning” helps the audience reflect on their own personal identity and understand the lives of those performing. The “Soil Turning” performances continue this week, with a performance Thursday, May 10 at 7:30 p.m. and Saturday, May 12 at 1:30 p.m.